Religious liberty has become a major topic of discussion in recent months. There were worries about presidential candidates or potential Supreme Court justices who may scale back the freedoms that have been enjoyed by Americans for more than two centuries. However, not everyone understands the full extent to which religious liberty should be applied. With the First Amendment’s promise that “Congress shall make no law respecting an establishment of religion, or prohibiting the free exercise thereof,” adherents to all faiths were guaranteed the right to the free exercise of religion. As a result, religious groups were free to take to the highways and byways to proclaim what they believed. The right to religious liberty ensured that Christians and others would have the freedom to gather for worship, change their religious beliefs, and proselytize. However, such freedom is a delicate balance. No one religious tradition can be privileged over another. The predominant religion of one generation may be the minority in the next. The religious liberty we enjoy today is much like the unique features of the Roman Empire that aided the spread of the gospel in the first century. The network of roads between major commercial cities, the common Greek language spoken throughout the empire, and the relative peace brought by Roman military dominance assisted the early believers in taking the message of Christ throughout the empire. Today’s political landscape is vastly different from first century Rome, but the religious nature of society is similar. We live in a syncretistic culture where people pick and choose what they want to believe. While this may seem like a detriment to the overall religious health of our American culture, it can also serve as an aid in sharing the gospel. Christianity should not be privileged in an environment of religious liberty, but I believe it can win the day in the marketplace of ideas when we take the opportunity to proclaim its truth. Religious liberty does not give Christianity a privileged position in the culture. In theory this freedom puts all religions (or even the lack of religion) on equal footing. Consider this for a moment. The next time Mormon missionaries knock on your door and try to convince you that the Church of Jesus Christ of Latter Day Saints is the restoration of the true church and that you need to be baptized in their church in order to enjoy the benefits of salvation, remember that they are exercising religious liberty. The next time that the Muslim community decides to build a mosque in your neighborhood (or even next door to your church), remember they are exercising religious liberty. Since religious liberty guarantees us the right to exercise our faith freely, the government cannot coerce what we believe to be false religions to give up their beliefs or plans for worship. Thus, religious liberty ought to motivate us to share the gospel. In a country where religious liberty is currently protected, we should take advantage of this freedom and reason with others, persuading them to hear and receive the gospel. This is the unique connection between religious liberty and the gospel. May we not take for granted our liberty and fail to share the truth with a lost and dying world. 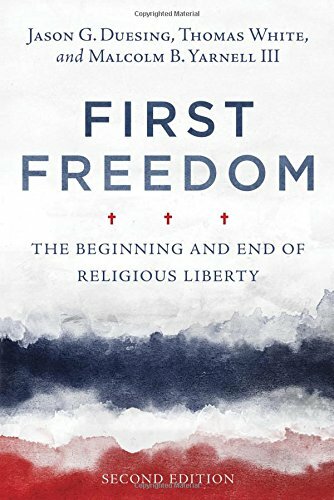 If you want to read more about religious liberty, let me encourage you to pick up a copy of First Freedom: The Beginning and End of Religious Liberty. facing family, liberty, work and culture today.